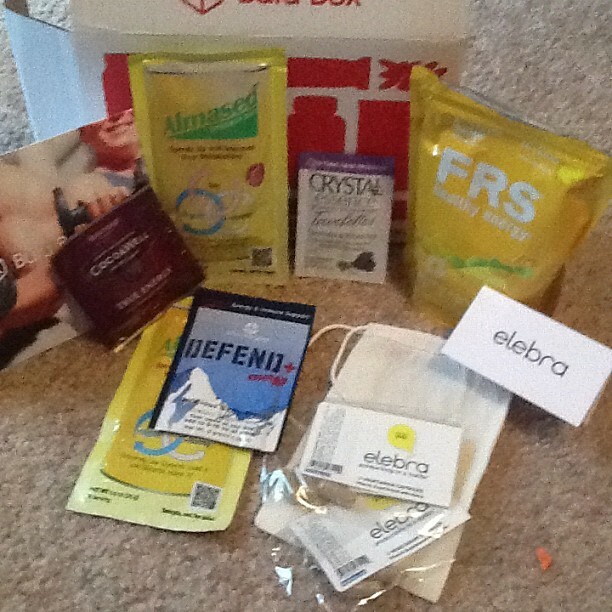 I was sent a Bulu Box to review a couple weeks ago. Here is what I got in my box. I think my favorite thing is the bag of 30 FRS chews. I found them on Amazon on sale for as low as $12:46 a bag. Since the Bulu boxes are $10, I think that makes the Bulu Box a pretty great deal. There were 6 different samples in the box. I think out of the 6 there are three that I would consider purchasing. The FRS, the Crystal Essence Towelettes, and the Defend. I think liking 50% of the box isn't too bad. The other things weren't bad I am just not into energy pill type supplements or diet shakes. I don't really need to lose weight and I think I usually have lots of energy. I like that you can choose month to month subscriptions so you can cancel at anytime and resume at any time. If you like something you sample you can find it on their website to buy for yourself. Although I did find that most things were cheaper on Amazon most notably the FRS chews. I think it is a great way to get to sample different things and for ten dollars a month not a bad price, especially this box with the FRS chews. So what can you expect if you sign up for Bulu Box? Every month, you'll get a box filled with 4 to 5 premium, curated samples from top brands. Look forward to a new mix of products for both women and men, including vitamins, weight loss, sports nutrition, protein, diet, energy, detox, digestion, sexual health, herbs, natural remedies, endurance and more. or tweet at them on Twitter. Have you tried a Bulu Box? What did you think? It's interesting that they put weight loss things with stuff like chews. Kinda going two different directions. Looks pretty cool overall and worth the money! Cool... wonder if they ship to Canada?! I'll have to check it out. I always have to check out what the shipping to Canada situation on these things looks like, but it does appear you scored a hit with the box you sampled, for sure. Looks like a good collection and the price is great! Very cool! I got some samples of FRS chews at an expo, but I have never tried them before. Do you like them? I am a honey stinger gal at the moment, but willing to branch out. I've never tried it, interesting. I'm curious about the FRS chews now! When I saw your pic, the first thing I thought of was how expensive FRS chews are. You're right. That alone made the box worth the $$! I like the concept, but I'd prefer more ability to pick and choose products. I despise wasting things and wouldn't want 1/2 box of useless goods.